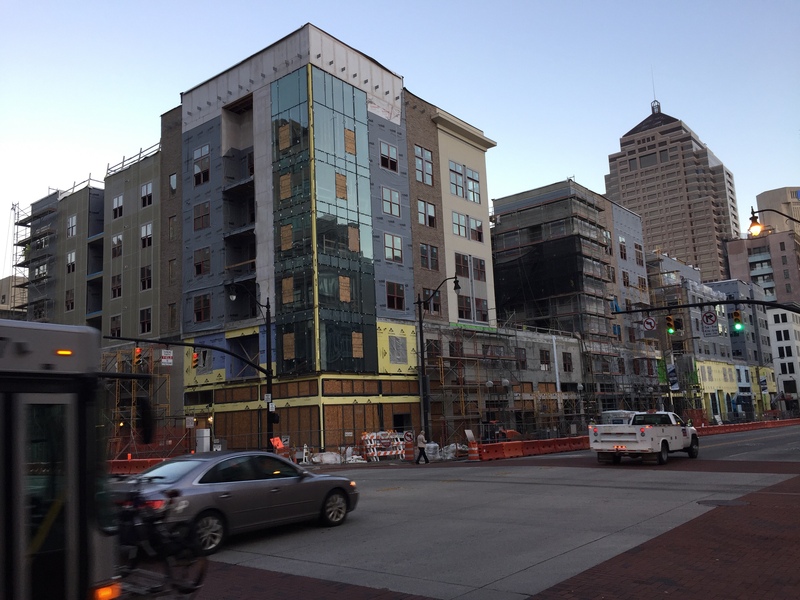 When I first started working at the law firm, more than 30 years ago, the lot at the western corner of Gay and High Streets in downtown Columbus was occupied by some kind of five and dime store. It may have been a Woolworth’s, it may have been a Kresge’s, but there was a building and business there where I bought some small item, once. I only went there once, because very soon after I made my purchase the building was torn down and the lot was paved over for parking. It was one of the last gasps of the Columbus urban craze for demolishing old buildings that left the core area of downtown a veritable wasteland of ugly surface parking lots. The preponderance of parking lots gave the center of downtown a kind of sad, scarred feel that made you wonder whether the area would ever be revived. But slowly, over the past decade, many the surface lots are being replaced with buildings. Some of the buildings are pure residential developments, many are mixed-use concepts with retail on the ground floor, office space above, and residential at the top, and a few purely commercial buildings have been constructed, too. And some of the commercial buildings with parking lots have been converted into something that is much more interesting — like the former tire and lube business a few blocks from the firm that was turned into a cool bar, with its former parking lots becoming fenced-in outdoor seating areas complete with fire pits and games and food truck space. And now the big, long-empty lot at the corner of Gay and High has finally joined this welcome trend. Work has been ongoing for a while now, and as the picture with this post indicates, it’s getting close to being done. It’s a huge project that is one of those mixed-use developments, and the buildings look pretty cool — and are much preferable to the grim asphalt expanse that we’d been looking at for years. We’re now wondering what business might move into the ground floor options, and are hoping they will add to the buzz on Gay Street — for some years now the coolest street in downtown Columbus largely because the original buildings on the block between High Street and Third Street somehow survived the wrecking ball. After more than three decades, our little part of the world is being reconfigured. Scratch another surface parking lot and substitute something more attractive and vibrant and hopefully a harbinger of more to come. Our downtown is on the move, one parking lot at a time, and we couldn’t be happier about it.